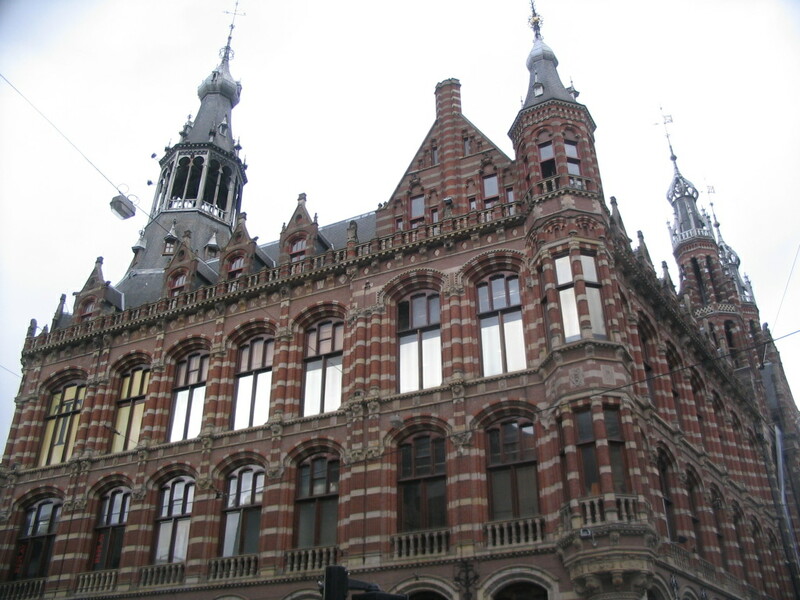 Our last destination after the Beurs, and our last gathering as a class, was at the Rijksmuseum, designed by Pierre Cuypers and originally completed in 1885. We happened to be there during the middle of the museum's decade-long renovation period. 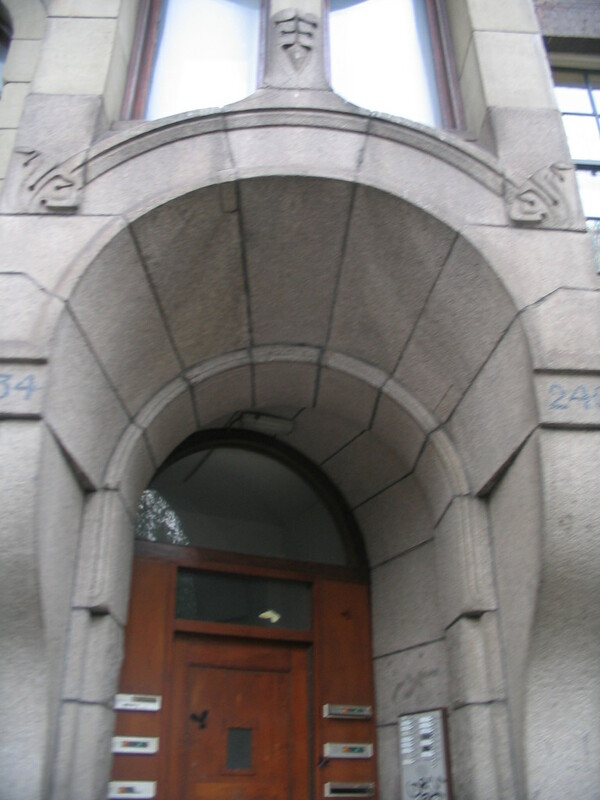 As of this writing, the renovations were finished just under a month ago, in April 2013. 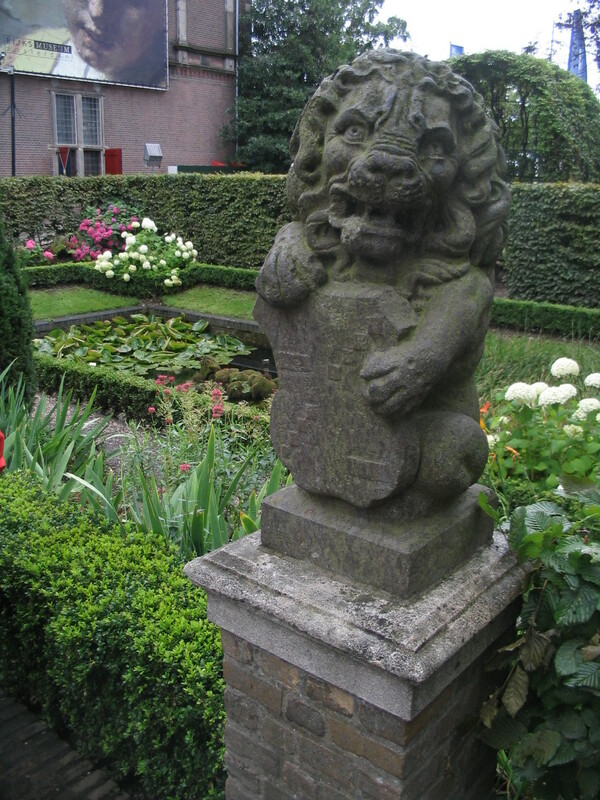 Rijkspigeons, looking sleepy or chilled or both, on the gate leading into the museum gardens, at the corner of Hobbemastraat and Jan Luijkenstraat. 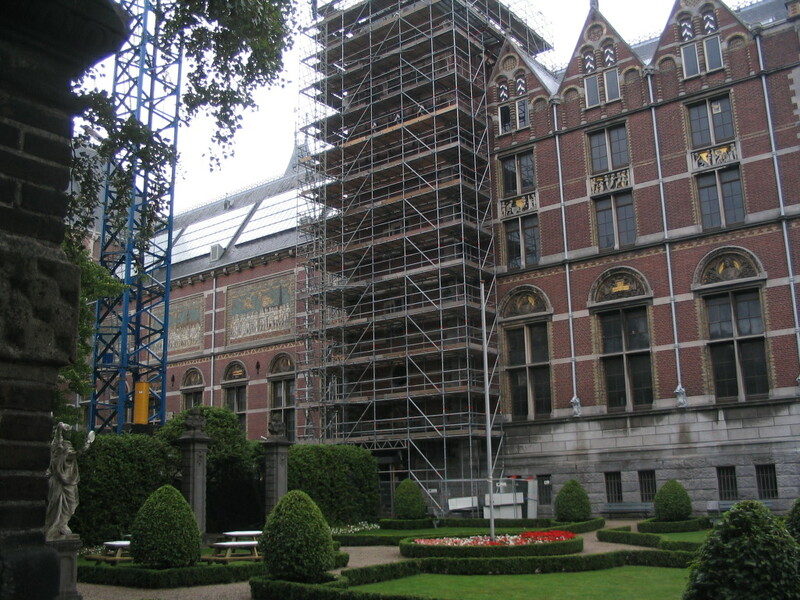 The dense repetition of the scaffolding offers quite a visual contrast within this otherwise serene garden scene. 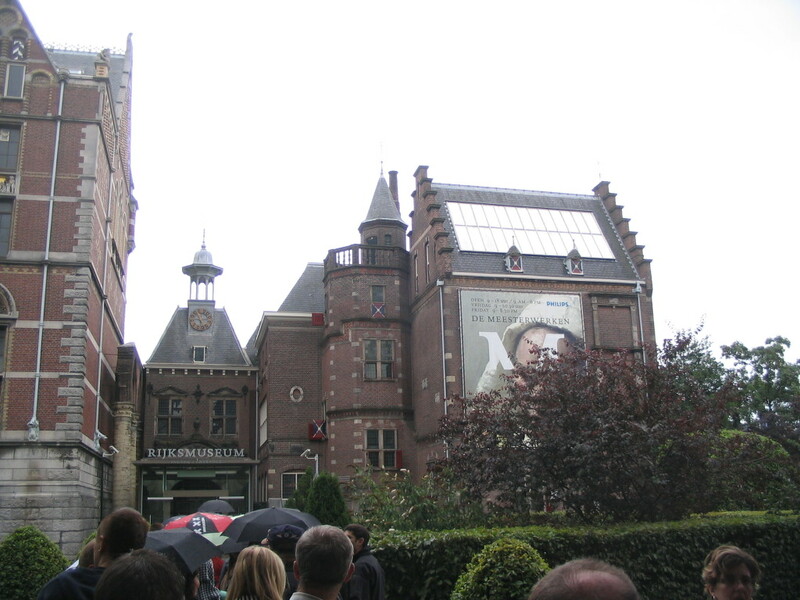 Standing in line at the temporary main entrance at the rear part of the museum, the "fragment building" made from pieces of older, demolished buildings, according to the Wiki article. Whoa. The lion is venting about how long the construction is dragging on. It's OK, guy, just let it all out. Despite the construction disruption, the museum visit was lovely. 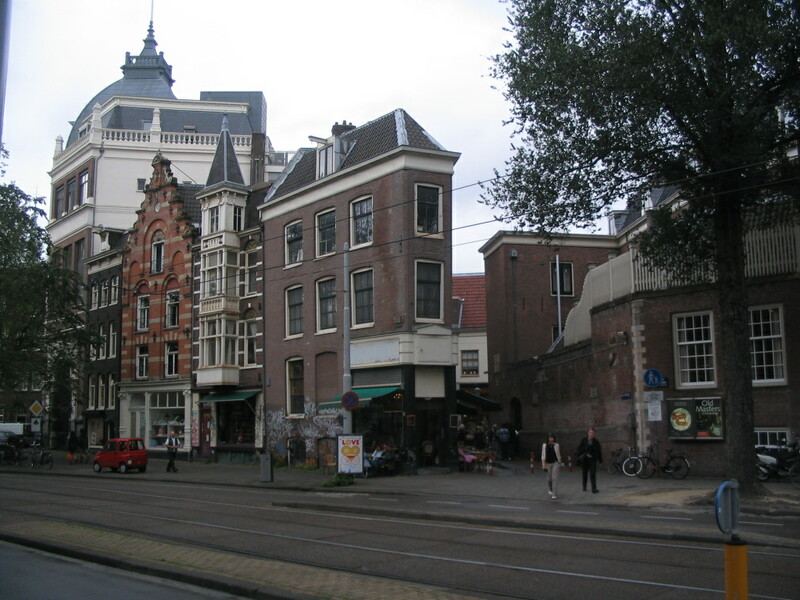 Afterwards I still had time for some more winding explorations on the way back to Centraal Station. 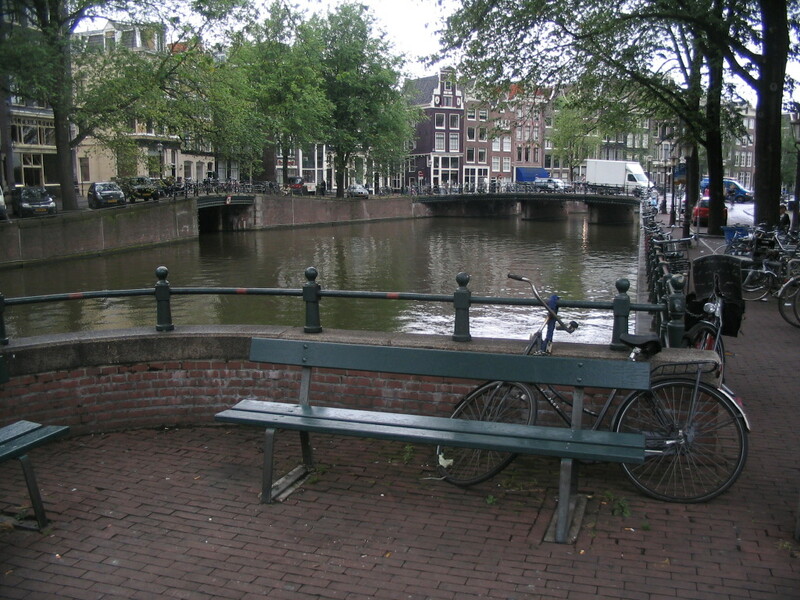 Here, back near the center, a pleasant corner on the bank of the Singel, where the Spui meets it. 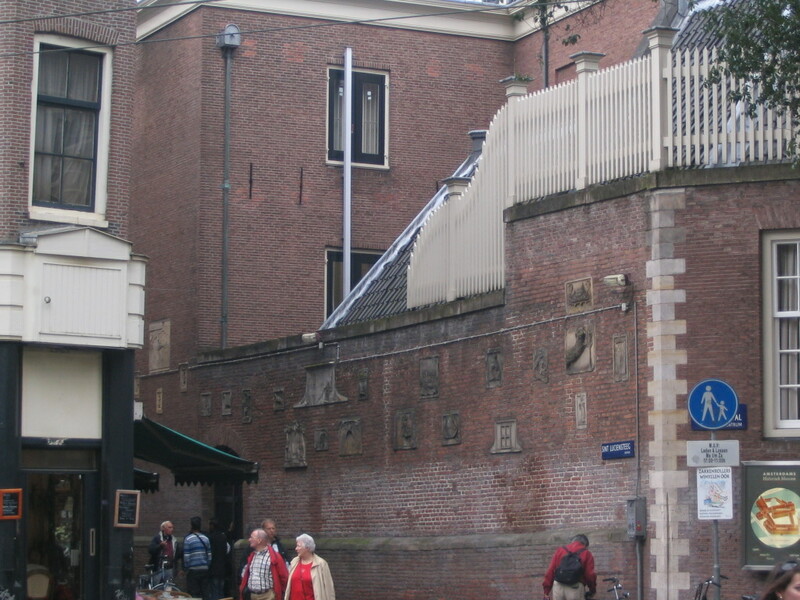 The Beulingsloot enters at left, and Huidenstraat crosses over further on. 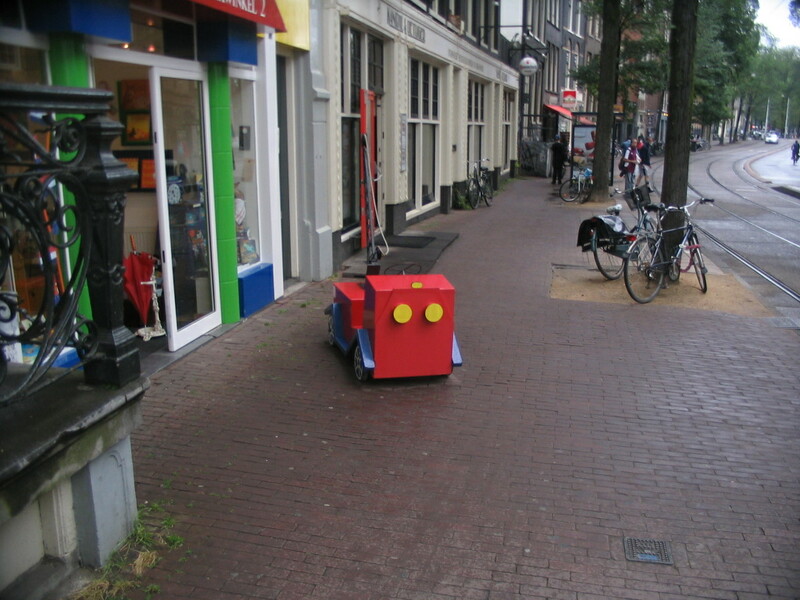 Attention: suspected robot detected at southern end of Nieuwezijds Voorburgwal. Intentions unknown. Exercise extreme caution. Complex but subtle curvature just up the street, south of Roskamsteeg. It appears to be an Amsterdam School production. 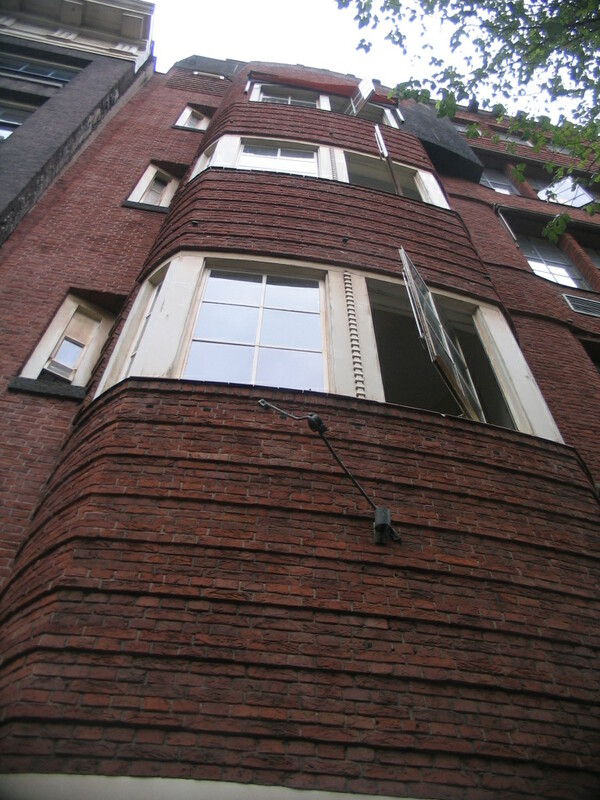 A very compact corner at Nieuwezijds Voorburgswal and Sint Luciënsteeg. 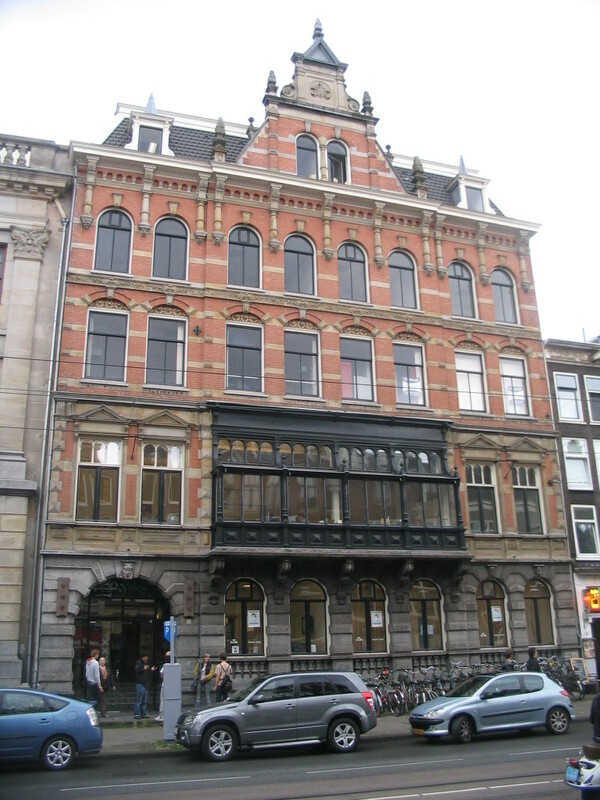 At the same corner, a fascinating set of intaglios on the Amsterdam Museum. 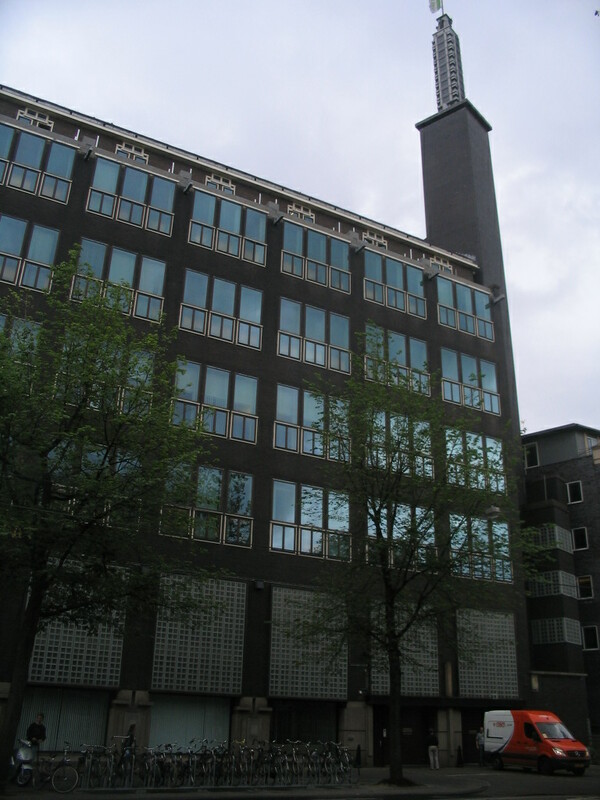 Some pretty cool double curvature at the old Algemeen Handelsblad building further up Nieuwezijds Voorburgwal, near the Royal Palace. 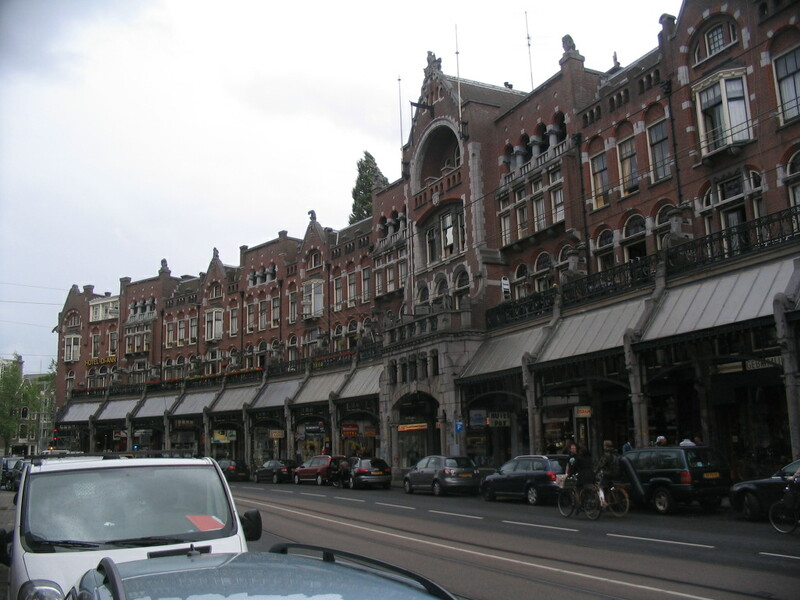 And still further along, it's Magna Plaza again. 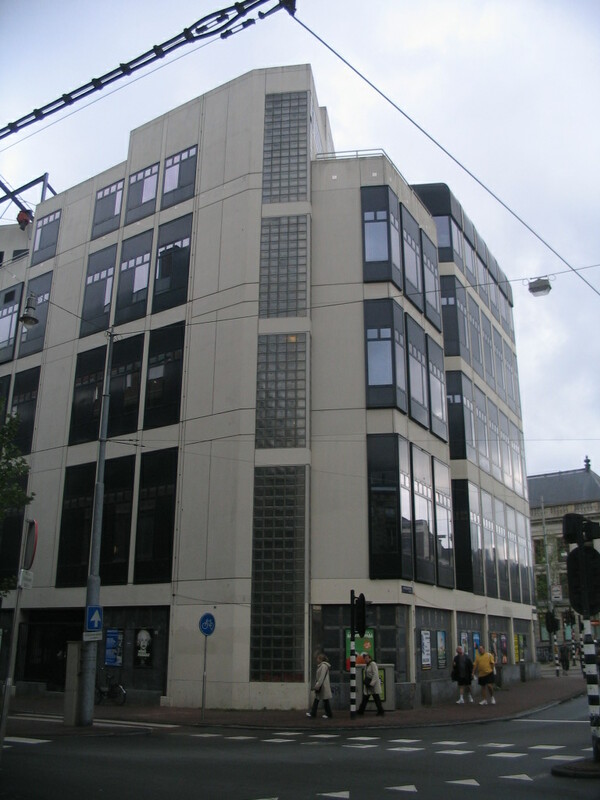 Catty-corner from the Magna Plaza at Spuistraat and Raadhuisstraat, a building of similar scale but basically opposite detailing. 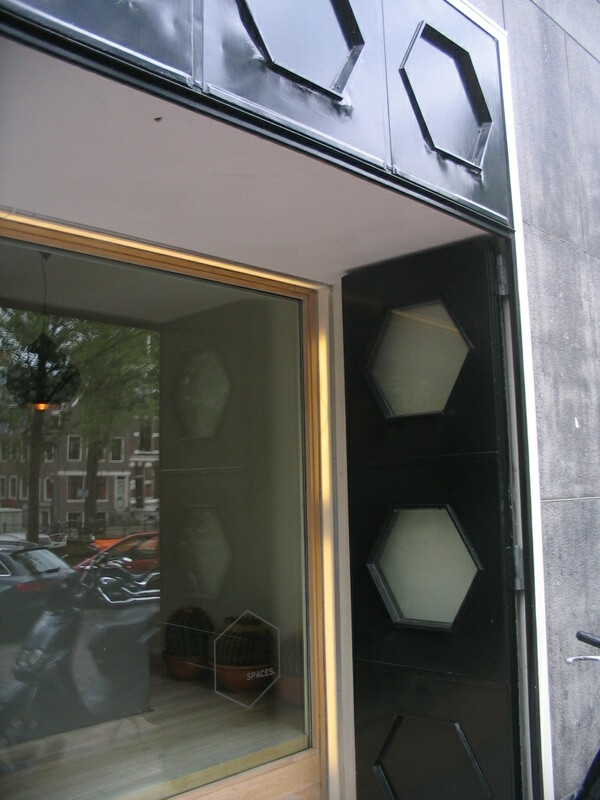 An intermingling of heavy and light materials further west on Raadhuisstraat, past the bridge over the Singel. 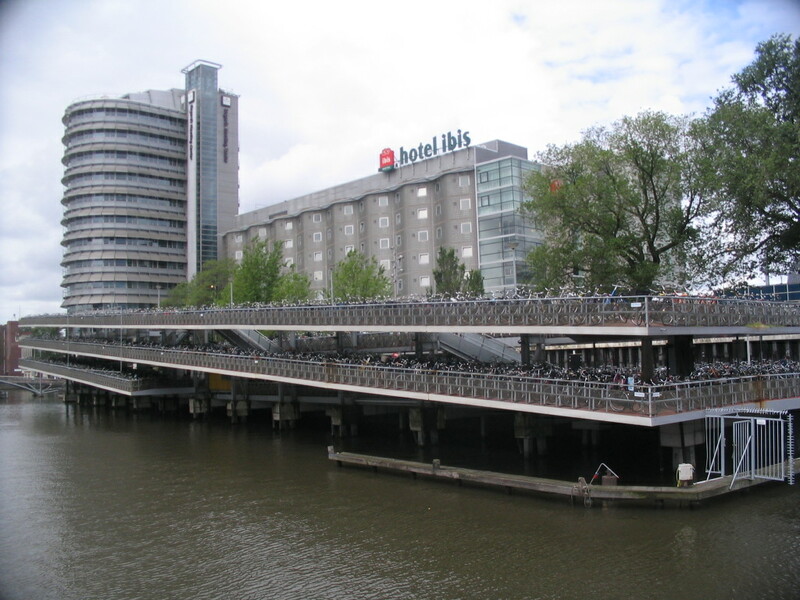 Still further along between the Herengracht and the Keizersgracht is this rather astonishing curved block that appears to comprise a whole bundle of hotels. I have not been able to sleuth out any info about its history. 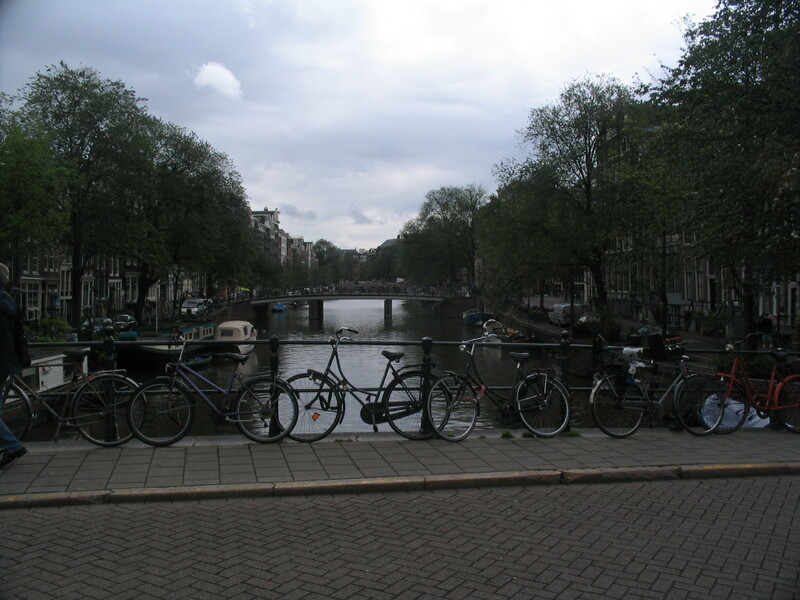 I zigzagged north along the Keizersgracht, east along the Leliegracht, and north along the Herengracht. 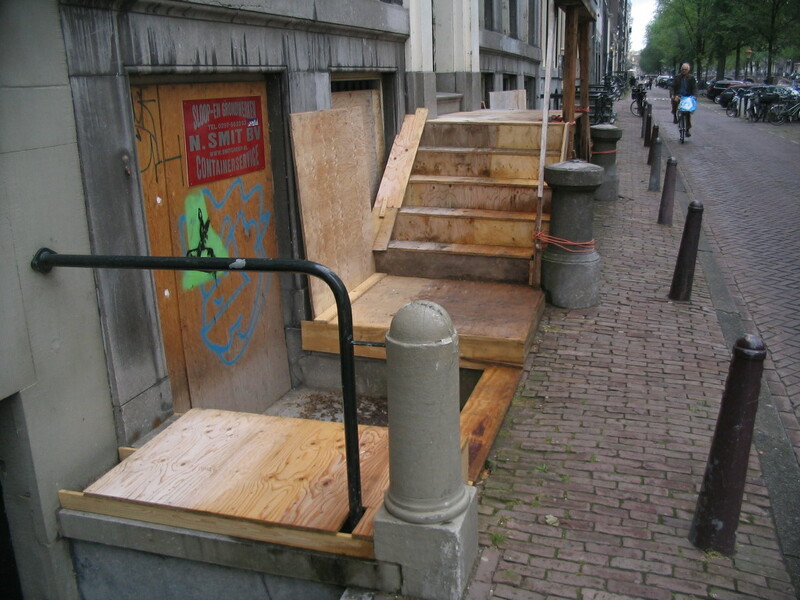 Here on the west side of the Herengracht, formwork for the rebuilding of a stoop. 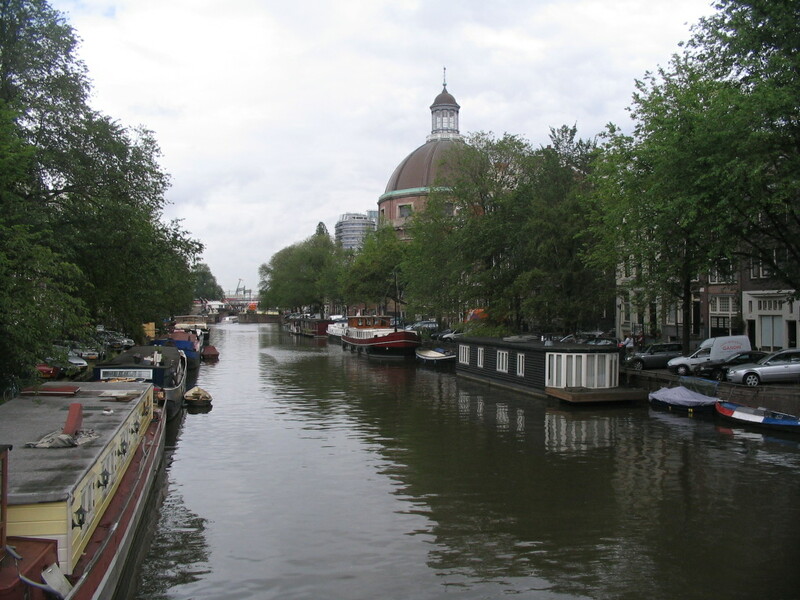 From the Korsjesportsteeg bridge over the Singel, the great dome of the Ronde Lutherse Kerk stands out to the north. To the south, a smattering of vehicles of various types and distances. 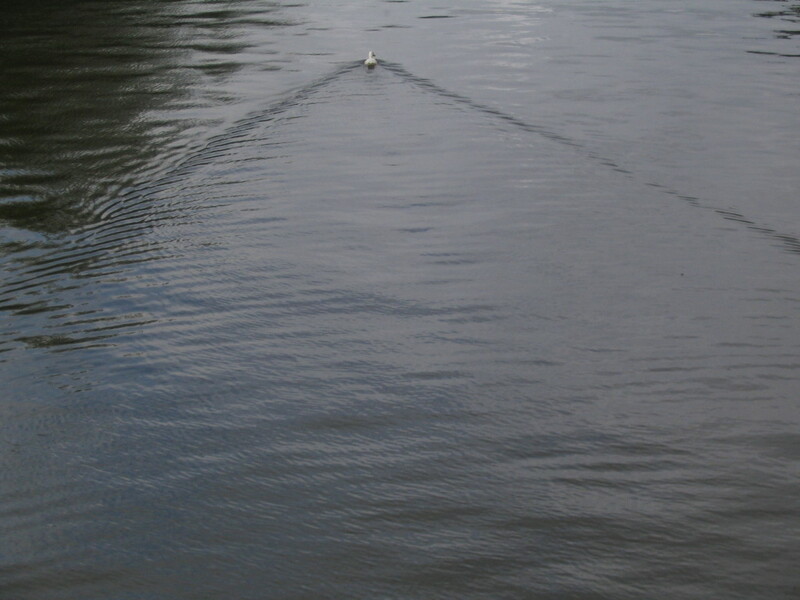 Slow down, duckmeister, this is a no-wake zone. 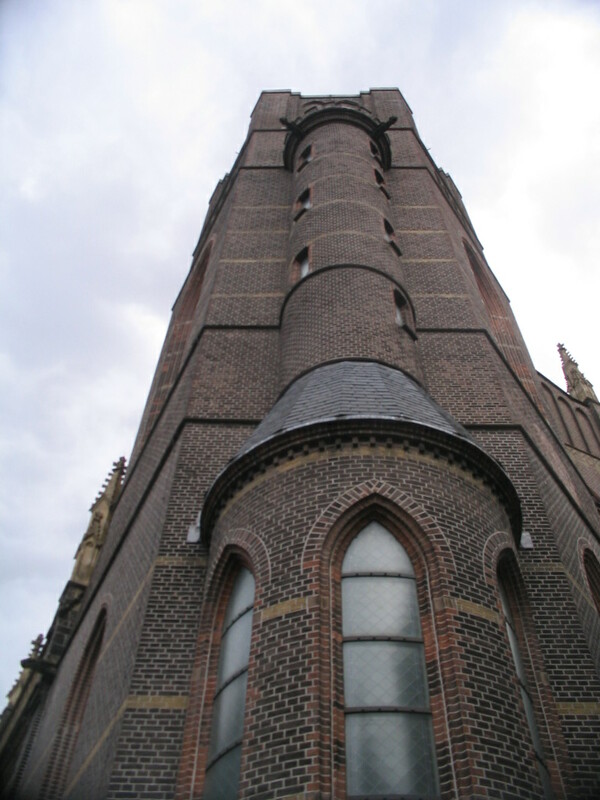 The hexagonal tower of the Neo-Gothic Dominicuskerk at Korsjespoortsteeg and Teerketelsteeg. That's a pretty smooth design move at a 60° street intersection. Who thought this up? 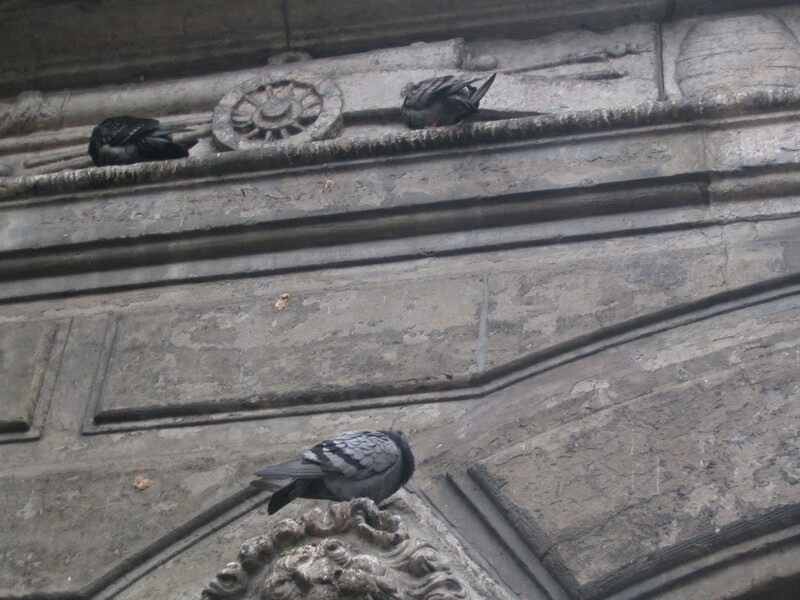 Why, Pierre Cuypers, of course. 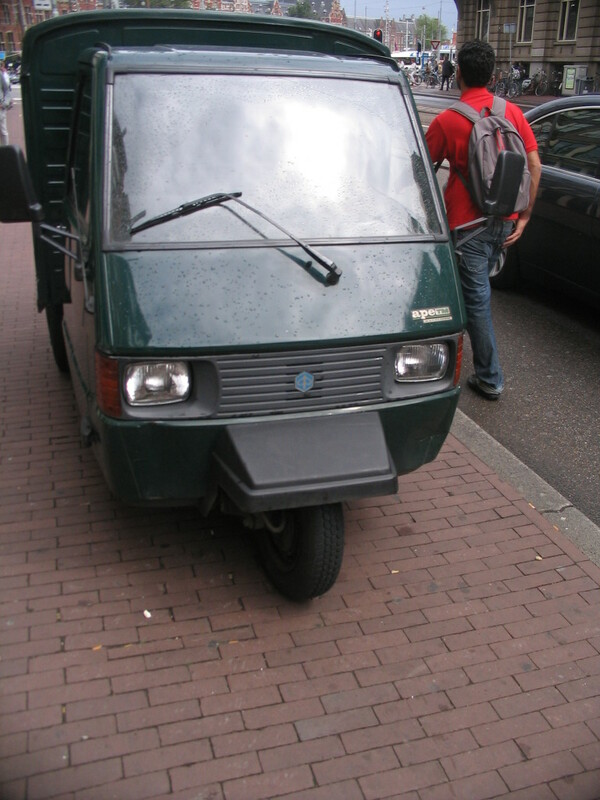 On Martelaarsgracht almost at Centraal Station (visible in the background) was this cute little tricyclic delivery van. 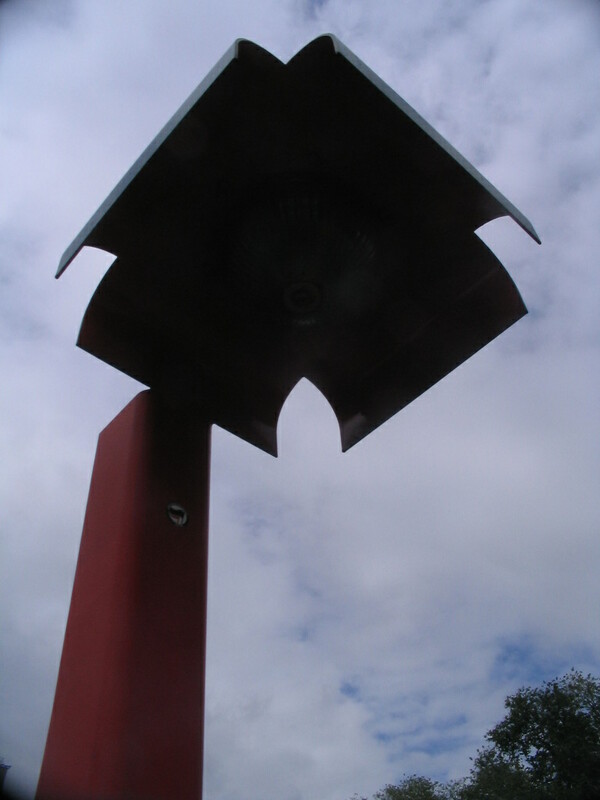 A heavy-metal-flower lamp on the bridge by Martelaarsgracht connecting to Centraal Station.